The Journalists Association of Korea has given its strong backing to a new initiative to eliminate the practice of bribery in journalism. "We support and welcome a new campaign to get rid of all forms of corruption in the world media industry, which is supported by the International Federation of Journalists and other global media organizations," said Lee Sang-ki, president of the JAK, July 28, 2004. 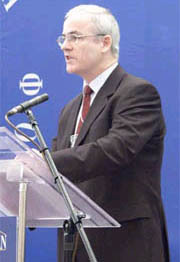 Lee's remarks came shortly after the IFJ issued a statement supporting the elimination of the practice of bribery in journalism. "The problem of 'journalism for sale' or paid-for material posing as legitimate news reporting is one of the greatest challenges facing media today," said Aidan White, general secretary of the IFJ, in a statement. "The practice erodes public confidence, undermines professionalism and makes a mockery of ethical values." The IFJ is one of the six organizations supporting a set of principles aimed to foster greater transparency in the dealings between public relations professionals and the media, and to end bribery for media coverage throughout the world. The other five are the International Press Institute, the Transparency International, the Global Alliance for Public Relations and Communications Management, the Institute for Public Relations Research and Education, and the International Public Relations Association. The 25th IFJ World Congress in Athens, Greece, in May this year called for action to promote quality in journalism. White said in the statement, "This set of principles is a welcome step from within the industry to get the mission of journalism back on track and to eliminate all forms of corruption." 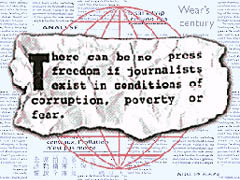 The principles, embodied in the Charter on Media Transparency developed by the International Public Relations Association, stress that news materials should appear as a result of the news judgement of journalists and editors, and not as a result of any payment in cash or in kind, or any other inducements. The charter also underlines that material involving payment should be clearly identified as advertising, sponsorship or promotion. It also stipulates that when samples or loans of products or services are necessary for a journalist to render an objective opinion, the length of time should be agreed in advance and loaned products should be returned afterward. "The media should institute written policies regarding the receipt of gifts or discounted products and services, and journalists should be required to sign the policy," the charter said. The IFJ general secretary said of the charter, "This initiative is most welcome and it sheds a welcome light on the often shadowy dealings between the business world and journalism and helps us focus on the need for quality media." In 2003, the Institute for Public Relations Research and Education and the International Public Relations Association released an index ranking 66 countries for the likelihood that print journalists will seek or accept cash for news coverage. The institute's study of bribery for news coverage and be accessed at: www.instituteforpr.com.